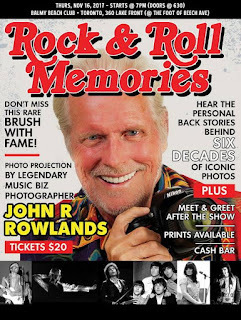 The Wire Megazine Concert Blog: Legendary Music Biz Photographer John Rowlands shares stories behind his iconic photos from the last 6 decades! John Rowlands is a world-renowned photographer & is the best-kept secret the record industry has had for well over half a century, 58 years to be exact. All starting in an era where photography was rare & in high demand by rock n roll record labels in the 60's. Oshawa born photographer John R Rowlands was commissioned to capture photos of popular music personalities & other celebrities by their record labels, management or the press. Rowlands has traveled the world & accomplished things many photographers could only dream of. Through it all he has amassed a unique collection of negatives, slides & digital files all the while becoming known as a Photographer to the Stars. It began in Ottawa on September 26, 1960, when Rowlands' 'hobby' turned into a 'career' in the blink of an eye & the zap of a flash bulb! At 13, he'd bought a ticket to popular singer Brenda Lee's touring road show & knew as a fan, that the only chance he'd have in taking her home was on the film in his camera. Shooting a full roll of film of the show, he met her, chatted with her backstage, carried her suitcase to her station wagon, got an autograph, her address in Nashville & a kiss on the cheek! Without knowing it, his life changed on that day. Two weeks later after mailing the snapshots to Nashville, he received a call from her manager who requested the negatives. John forwarded them. Three weeks later the mail contained his first photographic pay cheque of $35. Soon, thereafter, he was photographing Sam Cooke. As time passed the offers became more frequent & contained substantial increases in compensation. By 1963 Rowlands was known by several working editors of International fan magazines. SIXTEEN Magazine, in New York City, had become his first steady account. By the eleventh grade, at the age of sixteen, John approached Capitol Records who had just signed an Ottawa band, The Esquires, & showed them photos he’d done of them before they signed with the label. This venture brought forth a career shift & a key to the door of the record industry was at hand! 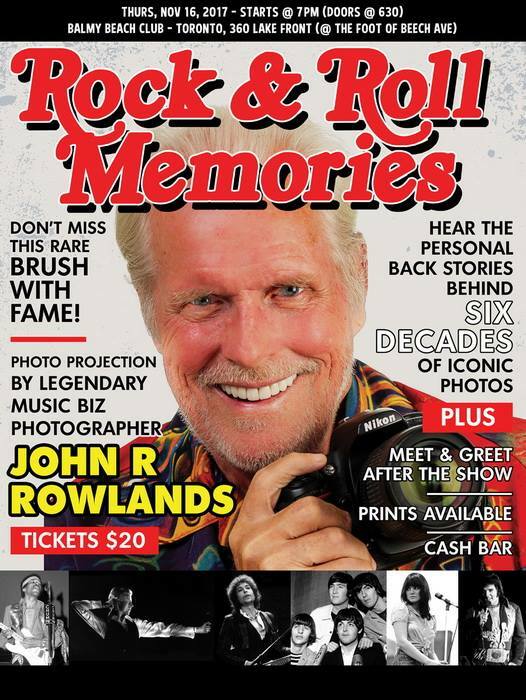 On November 16th, 2017 at 7pm (630pm door), John Rowlands brings his ROCK & ROLL MEMORIES to Toronto's Balmy Beach Club at 360 Lake Front ( at Beech Avenue). Truly a night to remember as John shares his legendary photo collection while narrating the stories behind these music legends, spanning almost 6 decades. Prints available during the meet & greet, post-show. Hurry don't delay, call & inquire for your $20 ticket availability today.